We just spent 45 minutes turning the house upside down trying to find my daughter's "Dolly" and she is nowhere to be found. It's strange, because I cleaned the house top-to-bottom, so I cannot imagine where she could be hiding. Luckily, we have a spare, and my daughter is fine with that, but I realized that I've never told you about my daughter's Dolly and I wanted to share a little bit about her, because others out there might like her, too. My daughter's "Dolly" is the Kids Preferred Asthma and Allergy Friendly Buttercup Doll. 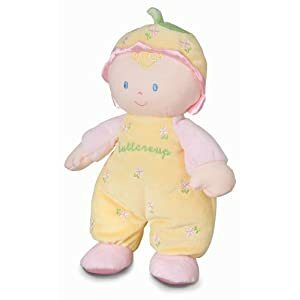 Buttercup Doll measures 11" tall perfect for cuddling with confidence. This sweet dolly gets her name from her buttery yellow outfit complete with a yellow cap. Her inviting smile and soft features make her the perfect companion for a snuggle, a car ride or tucked under the covers all night. Certified asthma & allergy friendly. Toys with the asthma & allergy friendly certification mark are an ideal choice for those concerned with asthma and allergies. Toys bearing the asthma & allergy friendly certification mark have been scientifically tested and shown to be more suitable for people with asthma and certain types of allergies. These toys can be washed frequently to keep allergen levels low, and they do not contain harmful chemicals at levels known to trigger symptoms. The asthma & allergy friendly involves rigorous testing that includes: Surface and stuffing material analysis, allergen loading and demonstration of successful eradication, multiple machine wash testing, quality and safety testing. My daughter absolutely loves her Dolly and she is so soft and cuddly. She has been her close companion since she was about 18 months old. Once you find out your child has asthma and allergies, the stuffed animals are the first things to go, but I think this doll is a fairly safe option, if their condition is not too severe and if you follow the cleaning guidelines. She comes with instructions to keep her sanitized, but in all honesty I skip the freezing part, because my daughter's asthma is very infrequent and typically triggered by a cold or a food allergen, but I think it's awesome that there is a doll available that has that option. Dolly is durable and holds up well to being snuggled with night after night and carried around and toddler-handled throughout the day. Since I don't do the freezing part, I wash Dolly more often, and I bought a spare to rotate when the other is in the wash. They do "pill" a little after a few months, but I just use on of those fabric fuzz shavers (you can get one for $3) and she looks as good as new. I also purchased a set for my parents' house, as she sometimes spends the night over at their house. They are so inexpensive that it's very affordable to have spares to avoid any "lost Dolly" disasters!